Acoustic Control's 115BK "seems" in my limited opinion to have a good front cavity shape vs depth. Even with its large port blocked, response isn't too bad. Would the effects scale downwards to a 12 inch size? How much does its port area affect system tuning ? there was no damping whatsoever in the 115BK cabinet below. Fb for 115BK is ~53Hz. Here's a rare Karlson-type built by the late Ernst Beck and probably with license from Transylvania Power Company. 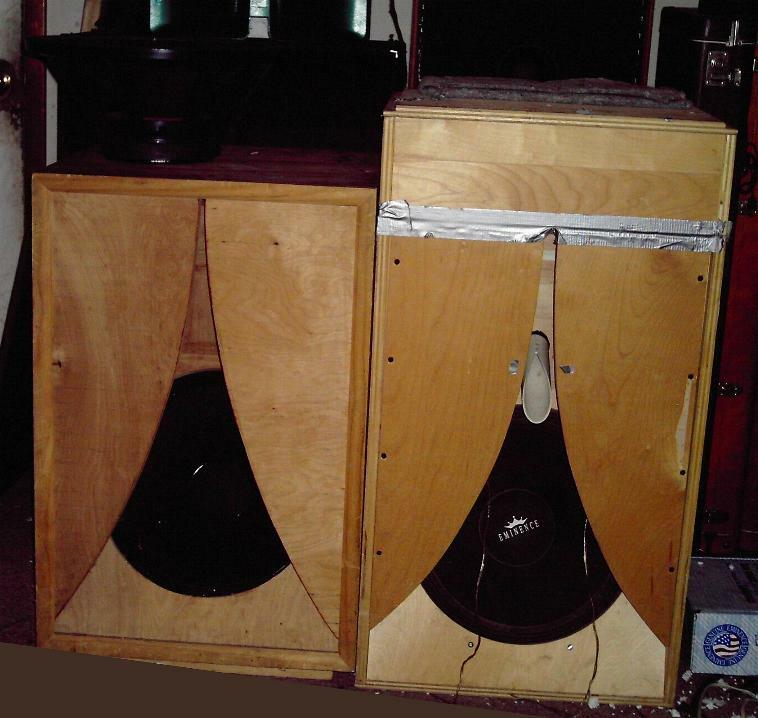 This particular cabinet is owned by Franz Stolz and has a 4" x 4" port vs 3.25" x 8.375" for the similar Acoustic Control 115BK. Last edited by freddi; 18th March 2019 at 12:42 PM. oh - when making these things - don't forget that the initial gap width may greatly affect the outcome of how they sound. 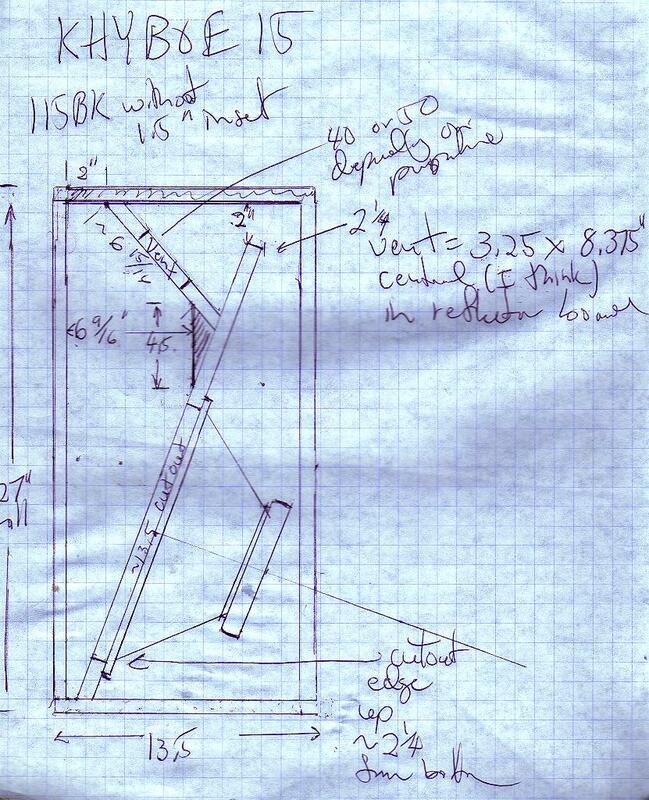 When I swiveled these same "wings" together for a 5/8" top gap width, it sounded like things were having trouble getting out of the cabinet - almost like it was "konstipated" -opening this particular set of wings to 1.2" top gap opened up the mids, highs, and bass "transients". It did not make hardly any difference to the microphone on and off axis, perhaps due to the large and varied source area. 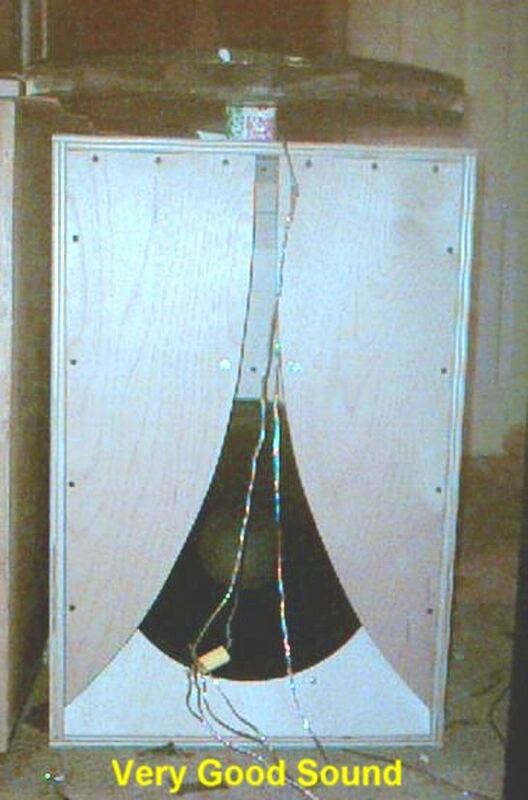 K-experimenter Carl would use several sets of wings to evaluate (perhaps with math - being math challenged - I have to do it "by ear"
this was a good little cabinet and the Smith distributed source horn a good compliment (I ran it in mono with vintage recordings) - Having an 18 inch speaker and less bulk than K15, it had a somewhat higher cutoff. It was made like a "big" (1958 style) K12 for its cavity - had a real lowpass choke. I added a 20 liter stub to the top of its front chamber which lowered f3 a bit and smoother ripple - but it sounded fine without the stub. Fred: what does the response look like? Where does it roll off at? 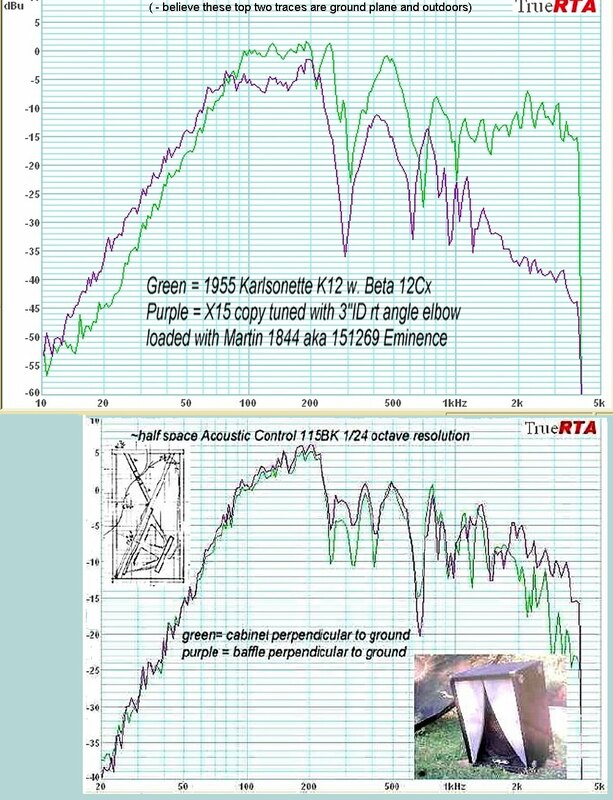 response was pretty smooth for an 18 inch driver - probably rolled off below 70Hz outdoors - adding a 20 liter top chamber made it more like K15 - IIRC the back chamber was only 78 liter not very big for an 18" speaker. FWIW I took wither 2.5 or 3 inches off the top of the wings to "raise" them - that didn't really matter soundwise. 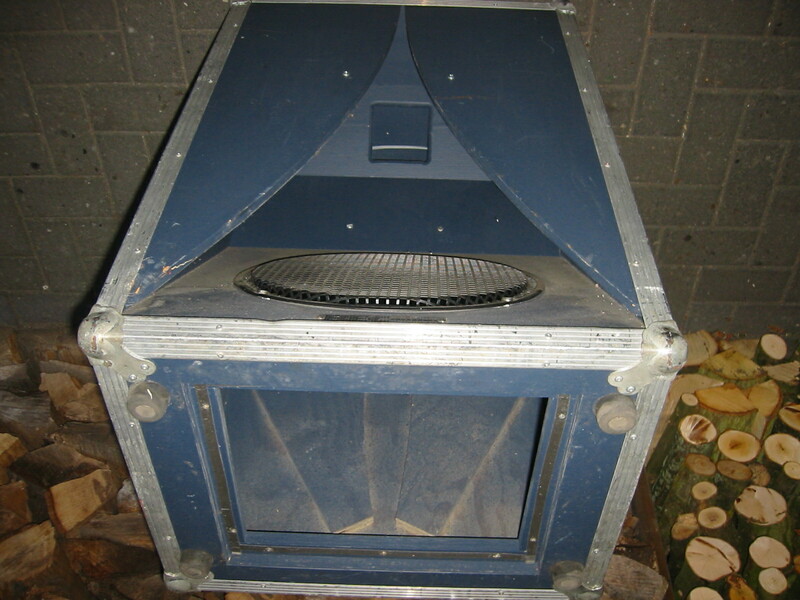 The original top for the cabinet is sitting, inverted on top of the extra 20 liter chamber in this picture. One time I had a much larger chamber on top - that I think created a notch in the response - much like it might in a BP sim. The cabinet on the left was an attempt at a "Fig.6." Karlson and originally ran a 15. I enlarged the opening with a jigsaw to 16 - that was my first "K18" and it could throw out a good shockwave. Without a front shelf, I think perhaps the chamber was too deep as the hole above 200Hz was greater than seen in K15. 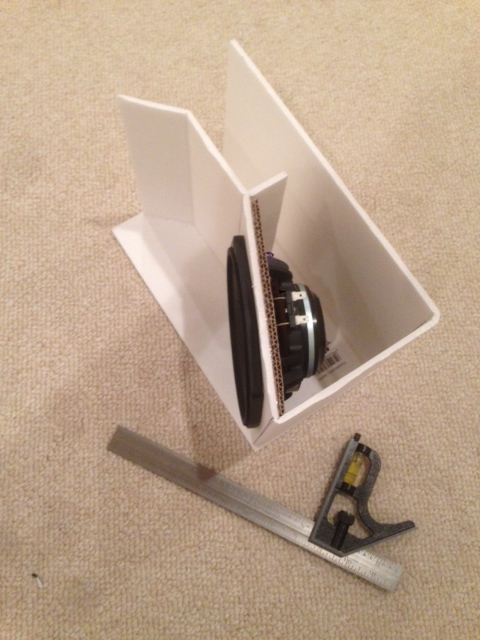 Then again , that cabinet had two vents rather than a centered vent and the center vent tends to do the most "fill". Last edited by freddi; 19th March 2019 at 10:59 PM. I'm planning to setup a home theater in my living room. But I'll be using a laptop which will be connected to a projector. In doing so, I followed these steps from a reliable site via google search result - How To Easily Connect Your Laptop To A Projector. Having said that, I want to know what type of speaker should to use. Can anybody help me? Rest assured all suggestions will be highly appreciated. Thanks. Are you considering a Karlson for HT? Not sure if this is the right thread for you. 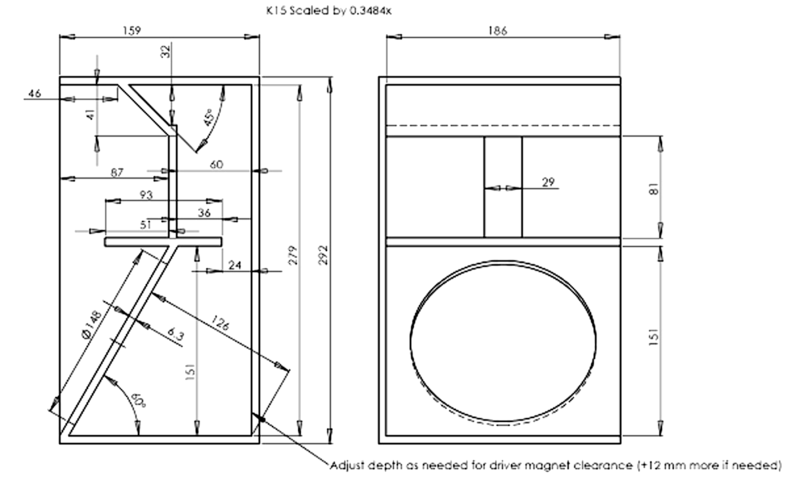 You could use smaller 0.46x scaled Karlson’s with a 6in pro audio coaxial driver. That will work well down to 100Hz and get you THX sound levels. Use a subwoofer below 100Hz. The K-aperture provides a wide sweet spot. @xrk971 - did you ever re-visit your little 6MDN44 K? - just wondering how that would sound for augmented by a capable tweeter compared to your other projects. Its too bad there doesn't seem to be any little 6.5CX like Diysoundgroup's Volt 6 available that's affordable. Last edited by freddi; 22nd March 2019 at 09:41 PM. Last edited by freddi; 22nd March 2019 at 10:26 PM.